The Zuehlsdorff Family Farm has delivered the goods yet again. This boneless leg of lamb is the very last piece of meat left from my meat share delivery of this past year. Talk about saving the best for last. I mean look at that gorgeous photo! 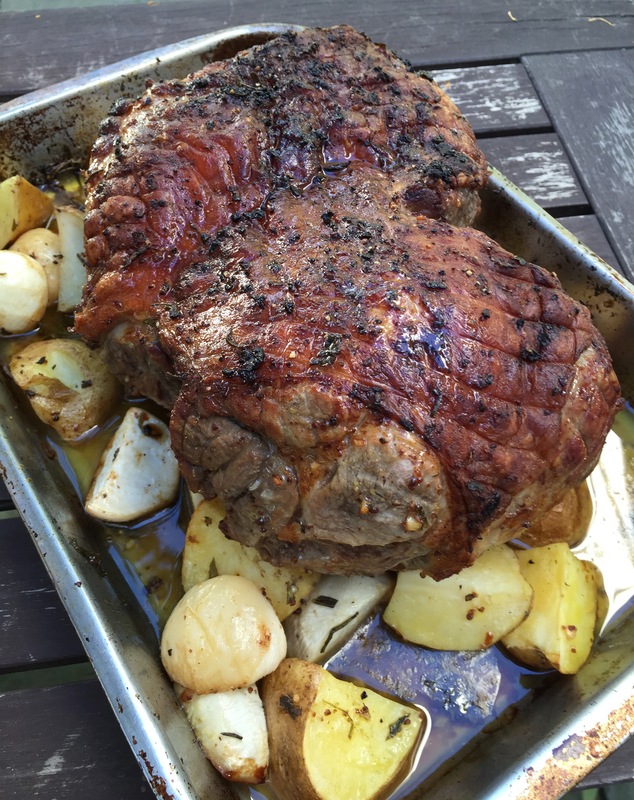 This roast turned out succulent, flavorful, absolutely divine. I know roasting a whole leg of lamb can sound like a daunting task, but, in truth, it’s so much easier than you think. Have your butcher do the hard work of tying or netting it up and all you need to do is whip up a fragrant rub or marinade (in this case a garlic-rosemary concoction) and stick it in the oven. It even takes less time than you might think: for medium rare, right around an hour and a half for a 6-pound roast should do it. So the next time you’re entertaining a larger crowd, dig this recipe out of your back pocket. You will impress the pants off your guests, I guarantee it. And you won’t even break a sweat. PS. More adventures in roasting meat are up ahead. I pick up my newest shipment of Zuehlsdorff Family Farm meat next Sunday. To make the Roasted Lamb and Vegetables: Take the lamb out of the refrigerator at least 30 minutes prior to cooking time so that it can come to room temperature. Pat the lamb dry all over with a paper towel and cover it while you get on with making the marinade. In a small bowl, combine the garlic, lemon zest and juice, mustard, chopped rosemary, parsley, and oil. Season to taste with salt and pepper and stir to combine. Into a large roasting tray, place the turnips and potatoes. Scatter over the rosemary sprigs. Place the lamb on top of the vegetables, skin-side up. Rub the marinade all over the lamb and season again with more salt and pepper. Pour the stock over the vegetables around the lamb. Roast the lamb and vegetables for about 1 hour 30 minutes for medium rare, or until a meat thermometer inserted into the thickest part of the lamb registers 130 to 135°F. Halfway through cooking time, rotate the pan so that the lamb browns evenly all over and add a little more chicken stock if the pan looks dry. Stir the vegetables to coat them all over with the liquid in the pan. Transfer the lamb to a large cutting board, loosely tent with aluminum foil, and rest for 15 to 20 minutes. Using a slotted spoon, transfer the vegetables to a large bowl and cover to keep warm. To make the Red Wine Gravy: Place the roasting pan with meat drippings across two burners on the stovetop. Heat the pan to medium-high heat, add the wine and bring to a simmer, stirring and scraping up any browned bits on the bottom of the pan (that’s where all the flavor is). Simmer until the liquid is reduced by about half. Add the stock and sift in the flour while stirring (this will prevent lumps). Continue to simmer and stir until the gravy thickens slightly (enough to coat the back of the wooden spoon). Adjust the seasonings to taste and strain into a gravy boat. Skim excess fat off the top. Cut the netting or tied kitchen string off the lamb and slice thickly or thinly (depending on your preference). Serve with the roasted vegetables and gravy. This entry was posted in main and tagged gravy, lamb, leg of lamb, potatoes, red wine gravy, roast, roasted vegetables, rosemary, turnips. Bookmark the permalink.